We are not just your regular marketing agency. Our knowledge of IT lets us work efficiently. How do you convert leads to customers? Do you get the most out of your website? When is the best time to reach out? And how to keep track of all your marketing efforts? Marketing automation provides answers to all these questions. Your expertise is being categorised into different stages of the buyer’s journey. We distinguish between information which is valuable for leads in that are orienting themselves, information relevant to potential customers who almost made their decision and which extras are meant for loyal customers. By means of these stages we create articles and white papers, infographics, videos or events. All of these are examples of marketing efforts in which your knowledge is being converted to action. Now that the foundations have been laid, we start working on a comprehensive marketing automation script based on personas and content. Content is being delivered to the target audience through e-mails or pop-ups on your website. Did visitors click, read or download something? Then the user enters a marketing automation campaign. This user will receive relevant information regularly. The more he responds to those messages, the more ‘points’ he earns with this behaviour. With this score, we can reliably define their place in the buyer’s journey. Marketing automation isn’t just about sending information. It’s also serves as a research tool. 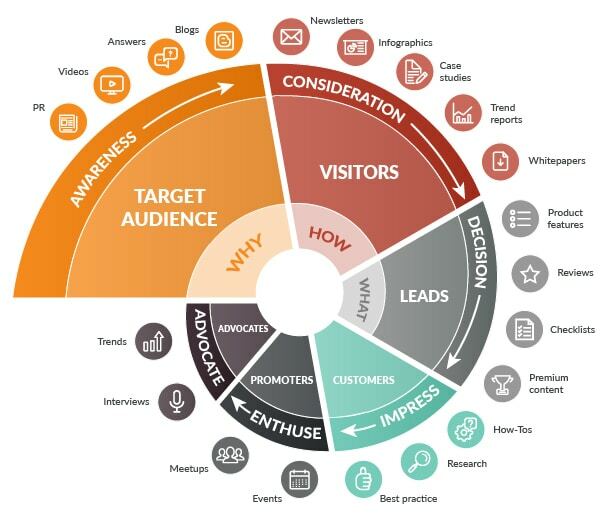 By analysing leads and online behaviour, marketing activities become measurable – so you can tailor your communications to the interests of your leads.